Hashimoto’s Thyroiditis: Often there very few initial symptoms aside from a goiter. However, over time, Hashimoto’s disease can progress to hypothyroidism and the goiter may shrink. Please note that the above list of symptoms is not complete. The best way to confirm or rule out any or all of these conditions is to have the appropriate blood testing. A blood test that looks at T3, T4 and Free-T4, TSH and thyroid antibodies (thyroid peroxidase and thyroglobulin) is a solid starting point. In recent months, several studies have appeared in the medical literature that offer hope to the many who wish to manage their thyroids as conservatively as possible. The information below is not intended to replace the advice of your healthcare team. However, it may well support even better treatment results and/or mitigate some of the adverse reactions that sometimes accompany conventional care. Dietary Considerations: A study published in the September 2016 edition of the journal, Drug Design, Development and Therapy reports that a low-carbohydrate and low-goitrogenic diet assists Hashimoto’s patients lose excess body fat, weight and prompts a significant drop of autoantibodies. Other research has linked gluten, a protein found in numerous grains, with thyroid dysfunction. Interestingly, one study found that hypothyroid patients requiring higher dosages of thyroid hormone therapy were more likely to have Celiac disease – an autoimmune disease triggered by gluten consumption. Soy Promise and Risk: Genistein, a phytoestrogen prevalent in soy, also has a positive (and perhaps broader) effect on thyroid function in those with Hashimoto’s thyroiditis (HT). 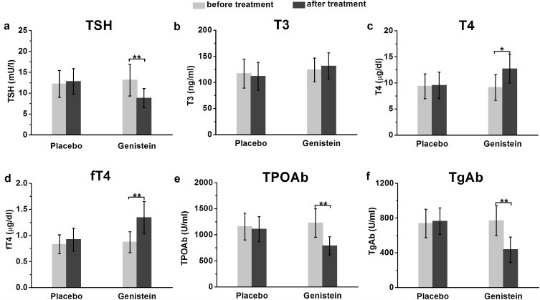 A trial published in the October 2016 issue of Immunobiology describes a normalizing effect in HT patients when 600 mg/day of genistein was administered over a one month period of time. That is not to say that soy is necessarily beneficial for all thyroid conditions. For instance, soy protein may negatively influence thyroid function in healthy individuals. It appears that women may be more susceptible to this effect. Minerals to the Rescue: A growing body of evidence points to the importance of the trace mineral selenium in regulating thyroid function and health. A handful of studies from 2015 and 2016 reveal that selenium-rich foods and supplements a) reduce thyroid autoantibodies in adults with chronic autoimmune thyroiditis; b) “enhance the effect of anti-thyroid drugs in patients with recurrent Graves’ disease”; and c) improve thyroid hormone levels in at-risk populations such as hemodialysis patients. 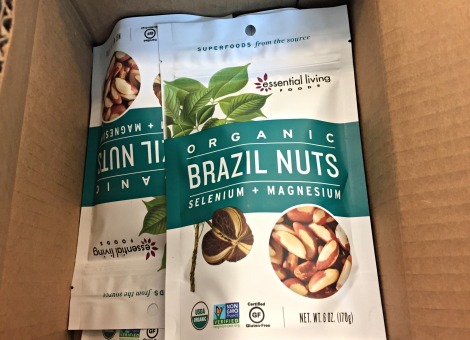 Some of these benefits may have to do with the fact that selenium is an antioxidant. Many experts theorize that oxidative stress may compound the effects of hypothyroidism. Zinc, another trace mineral, may work in concert with selenium in normalizing thyroid profiles in those with hypothyroidism. A high-potency multivitamin mineral in conjunction with a nutrient-dense diet will most likely provide adequate-to-optimal amounts of both elements. Autoimmunity and Vitamin D: Vitamin D, which is technically a hormone, is frequently deficient in autoimmune patients. In fact, one study found that over 85% of adults with Hashimoto’s disease were lacking in D. What’s most surprising is that the population studied resided in a very sunny part of the world: Crete. Fortunately, restoring 25(OH)D to a “normal” level (≥ 40 ng/mL) reduces signs of autoimmunity. While encouraging, this data points to the importance of Vitamin D testing and not relying on sun exposure as a sole source of this invaluable hormone. Diet and supplementation aren’t the only holistic options available for the promotion of thyroid health. Two of the most promising non-food and supplement alternatives are yoga and meditation. These mind-body practices tend to improve risk factors and symptoms relating to hypothyroidism, including elevated cholesterol, oxidative stress and menstrual irregularities, while reducing the need for thyroid medication. Also of note, meditation and yoga are well known to benefit mind-body health on multiple fronts: less anxiety, depression, fatigue and impaired sleep. BMC Complement Altern Med. 2016 Nov 16;16(1):471. The effects of Nigella sativa on thyroid function, serum Vascular Endothelial Growth Factor (VEGF) – 1, Nesfatin-1 and anthropometric features in patients with Hashimoto’s thyroiditis: a randomized controlled trial. BACKGROUND: Hashimoto’s thyroiditis is an autoimmune disorder and the most common cause of hypothyroidism. The use of Nigella sativa, a potent herbal medicine, continues to increase worldwide as an alternative treatment of several chronic diseases including hyperlipidemia, hypertension and type 2 diabetes mellitus (T2DM). The aim of the current study was to evaluate the effects of Nigella sativa on thyroid function, serum Vascular Endothelial Growth Factor (VEGF) – 1, Nesfatin-1 and anthropometric features in patients with Hashimoto’s thyroiditis. METHODS: Forty patients with Hashimoto’s thyroiditis, aged between 22 and 50 years old, participated in the trial and were randomly allocated into two groups of intervention and control receiving powdered Nigella sativa or placebo daily for 8 weeks. Changes in anthropometric variables, dietary intakes, thyroid status, serum VEGF and Nesfatin-1 concentrations after 8 weeks were measured. RESULTS: Treatment with Nigella sativa significantly reduced body weight and body mass index (BMI). Serum concentrations of thyroid stimulating hormone (TSH) and anti-thyroid peroxidase (anti-TPO) antibodies decreased while serum T3 concentrations increased in Nigella sativa-treated group after 8 weeks. There was a significant reduction in serum VEGF concentrations in intervention group. None of these changes had been observed in placebo treated group. In stepwise multiple regression model, changes in waist to hip ratio (WHR) and thyroid hormones were significant predictors of changes in serum VEGF and Nesgfatin-1 values in Nigella sativa treated group (P < 0.05). CONCLUSIONS: Our data showed a potent beneficial effect of powdered Nigella sativa in improving thyroid status and anthropometric variables in patients with Hashimoto’s thyroiditis. Moreover, Nigella sativa significantly reduced serum VEGF concentrations in these patients. Considering observed health- promoting effect of this medicinal plant in ameliorating the disease severity, it can be regarded as a useful therapeutic approach in management of Hashimoto’s thyroiditis. Open Access Maced J Med Sci. 2016 Jun 15;4(2):296-301. Thyroid Hormone Indices in Computer Workers with Emphasis on the Role of Zinc Supplementation. AIM: This study aimed to investigate the effects of computer monitor-emitted radiation on thyroid hormones and the possible protective role of zinc supplementation. MATERIAL AND METHODS: The study included three groups. The first group (group B) consisted of 42 computer workers. This group was given Zinc supplementation in the form of one tablet daily for eight weeks. The second group (group A) comprised the same 42 computer workers after zinc supplementation. A group of 63 subjects whose job does not entail computer use was recruited as a control Group (Group C). All participants filled a questionnaire including detailed medical and occupational histories. They were subjected to full clinical examination. Thyroid stimulating hormone (TSH), free triiodothyronine (FT3), free thyroxine (FT4) and zinc levels were measured in all participants. RESULTS: TSH, FT3, FT4 and zinc concentrations were decreased significantly in group B relative to group C. In group A, all tested parameters were improved when compared with group B. The obtained results revealed that radiation emitted from computers led to changes in TSH and thyroid hormones (FT3 and FT4) in the workers. CONCLUSION: Improvement after supplementation suggests that zinc can ameliorate hazards of such radiation on thyroid hormone indices. Asia Pac Psychiatry. 2016 Dec;8(4):302-305. Comparison of hair thyroid hormones between first-episode and recurrent patients with depression in female Chinese. OBJECTIVE: The aim of this study was to compare hair thyroid hormone (TH) levels among first-episode patients with major depressive disorder (F-MDD), recurrent patients with major depressive disorder (R-MDD) and healthy controls (HC). METHODS: The Hamilton Depression Scale (HAMD) and Hamilton Anxiety Scale (HAMA) were used to evaluate the clinical symptoms of patients. Electrochemiluminescence immunoassay was used to measure the hair TH levels. We compared the differences in hair TH levels among F-MDD patients, R-MDD patients, and HC. RESULTS: Before the disease episode, hair T3 levels differed significantly between F-MDD patients and HC. In the disease episode, hair T3 levels differed significantly between F-MDD or R-MDD patients and HC; and hair T4 levels differed significantly between R-MDD patients and HC. Hair T3 levels significantly negative correlated with HAMD scores in F-MDD patients. CONCLUSIONS: Our findings suggested that disease duration of recurring episodes of depression may influence hair TH levels. A Randomized Controlled Trial for the Effectiveness of Aromatherapy in Decreasing Salivary Gland Damage following Radioactive Iodine Therapy for Differentiated Thyroid Cancer. Objective. The aim of this study was to investigate effects of aromatherapy in decreasing salivary gland damage for patients undergoing radioactive iodine (RAI) therapy with differentiated thyroid cancer (DTC). Materials and Methods. The subjects were 71 patients with DTC. They were divided into aromatherapy group (group A, n = 35) and a control group (group B, n = 36). We blended 1.0 mL of lemon and 0.5 mL of ginger essential oils. The patients in the inhalation aromatherapy group inhaled this blend oil and those in the control group inhaled distilled water as placebo for 10 min during admission. We statistically compared salivary gland function before and after treatment between groups A and B. Results. In comparison with group B, the rate of change of the accumulation rate was significantly higher in the parotid glands and submandibular glands of group A (P < 0.05). In comparison with group B, a significant increase in rate of secretion change before and after treatment was noted in the bilateral parotid glands in group A (P < 0.05). Conclusion. Because an amelioration of salivary gland function was observed in the present study, our results suggest the efficacy of aromatherapy in the prevention of treatment-related salivary gland disorder. J Altern Complement Med. 2017 Aug 22. Efficacy and Safety of Ashwagandha Root Extract in Subclinical Hypothyroid Patients: A Double-Blind, Randomized Placebo-Controlled Trial. BACKGROUND: Subclinical hypothyroidism, a thyroid disorder without obvious symptoms of thyroid deficiency, occurs in 3%-8% of the global population. Ashwagandha [Withania somnifera (L.) Dunal], a traditional medicine in Ayurveda, is often prescribed for thyroid dysfunctions. OBJECTIVE: This pilot study was designed to evaluate the efficacy and safety of ashwagandha root extract in subclinical hypothyroid patients. DESIGN, SETTING, AND PARTICIPANTS: A prospective, randomized, double-blind, single-center placebo-controlled study was performed at Sudbhawana Hospital, Varanasi, India between May 2016 and September 2016. Fifty subjects with elevated serum thyroid stimulating hormone (TSH) levels (4.5-10 μIU/L) aged between 18 and 50 were randomized in either treatment (n = 25) or placebo (n = 25) groups for an 8-week treatment period. INTERVENTIONS: Ashwagandha root extract (600 mg daily) or starch as placebo. Efficacy Variables: Serum TSH, serum triiodothyronine (T3), and thyroxine (T4) levels. RESULTS: A total of four subjects (two from each group) withdrew their consent before the second visit. Eight weeks of treatment with ashwagandha improved serum TSH (p < 0.001), T3 (p = 0.0031), and T4 (p = 0.0096) levels significantly compared to placebo. Ashwagandha treatment effectively normalized the serum thyroid indices during the 8-week treatment period in a significant manner (time-effects: TSH [p < 0.001], T3 [p < 0.001], and T4 [p < 0.001]). Four subjects (8%) (ashwagandha: 1[4%]; Placebo: 3[12%]) out of 50 reported few mild and temporary adverse effects during this study. Lipids Health Dis. 2018 Mar 27;17(1):59. Powdered black cumin seeds strongly improves serum lipids, atherogenic index of plasma and modulates anthropometric features in patients with Hashimoto’s thyroiditis. BACKGROUND: Hashimoto’s thyroiditis is associated with serious alterations in serum lipids and glucose homeostasis. The aims of the current study were to evaluate the effect of powdered Nigella sativa on serum lipids, glucose homeostasis and anthropometric variables in patients with Hashimoto’s thyroiditis. METHODS: Forty patients with Hashimoto’s thyroiditis, aged between 22 and 50 years old, participated in the trial and were randomly allocated into two groups of intervention and control receiving powdered Nigella sativa or placebo daily for 8 weeks. Serum lipids, glucose homeostasis, and anthropometric variables were evaluated at baseline and after intervention. RESULTS: Treatment with Nigella sativa significantly reduced body weight and body mass index (BMI). Serum concentrations of low density lipoprotein cholesterol (LDL) and triglyceride (TG) also decreased in Nigella sativa-treated group after 8 weeks; while serum high density lipoprotein cholesterol (HDL) significantly increased after treatment with Nigella sativa (P < 0.05). None of these changes had been observed in placebo treated group. Serum Nesfatin-1 concentrations was in inverse relationship with serum triglyceride (TG) (r = - 0.31, P = 0.04). CONCLUSIONS: Giving attention to the potent beneficial effects of powdered black cumin seeds in improving serum lipid profile and anthropometric features in patients with Hashimoto’s thyroiditis, this medicinal plant could be considered as a beneficial herbal supplement alongside with the disease- specific medications including Levothyroxine in management of Hashimoto’s thyroiditis- related metabolic abnormalities. Exp Clin Endocrinol Diabetes. 2018 Jul 30. The Effect of Gluten-Free Diet on Thyroid Autoimmunity in Drug-Naïve Women with Hashimoto’s Thyroiditis: A Pilot Study. BACKGROUND: Autoimmune thyroid disease is often accompanied by celiac disease. OBJECTIVE: The purpose of this study was to investigate whether a gluten-free diet affects thyroid autoimmunity, hypothalamic-pituitary-thyroid axis activity and thyroid function tests in women with Hashimoto’s thyroiditis and incidentally found positive anti-tissue transglutaminase antibodies. METHODS: The study included 34 women with autoimmune thyroiditis divided into two group. The patients belonging to the first one (group A, n=16) complied with the gluten-free diet for 6 months, while the remaining patients (group B, n=18) remained without any dietary treatment. Serum titers of thyroid peroxidase and thyroglobulin antibodies, as well as serum levels of thyrotropin, free thyroid hormones and 25-hydroxyvitamin D were measured at the beginning of the study and 6 months later. Based on thyrotropin and free thyroid hormone levels, Jostel’s thyrotropin index, the SPINA-GT index and the SPINA-GD index were calculated. RESULTS: All patients completed the study protocol. In group B, serum thyrotropin and free thyroid hormones levels, serum 25-hydroxyvitamin D levels as well as the calculated indices remained at the similar levels. The gluten-free diet reduced thyroid antibody titers, as well as slightly increased 25-hydroxyvitamin D levels and the SPINA-GT index. In group A, the impact on TPOAb and TgAb titers correlated with the changes in the SPINA-GT index, whereas the impact on TPOAb with the changes in 25-hydroxyvitamin D levels. CONCLUSIONS: The obtained results suggest that the gluten-free diet may bring clinical benefits to women with autoimmune thyroid disease. Erroneous thyroid diagnosis due to over-the-counter biotin. OBJECTIVES: Biotin is a component of the vitamin B complex used in standard immunoassays to detect serum levels of various hormones and non-hormones, including thyrotropin (TSH) and thyroxine. These assays involve a strong bond between streptavidin and biotin, which serves as an anchor for measured analytes. Large doses of exogenous biotin for the treatment of certain medical conditions have resulted in assay interference, causing TSH to be spuriously lowered. Smaller doses of biotin found in dietary supplements also have caused assay interference. METHODS: We describe four cases in which over-the-counter (OTC) biotin caused erroneous thyroid diagnosis and clinical confusion in patients with preexisting thyroid disease. Serum TSH and thyroxine were measured by the Vitros 5600 assay. CONCLUSIONS: Although the biotin-streptavidin interaction is sensitive for detecting serum levels of TSH, it is subject to interference by exogenous biotin at levels found in OTC products. The widespread use of OTC biotin for cosmetic purposes can adversely affect the diagnosis of the entire spectrum of functional thyroid disorders. Physicians must carefully and routinely question for the use of biotin before thyroid function testing. J Clin Pharm Ther. 2018 Oct 10.
l-selenomethionine supplementation in children and adolescents with autoimmune thyroiditis: A randomized double-blind placebo-controlled clinical trial. WHAT IS KNOWN AND OBJECTIVE: Although a beneficial effect of selenium (Se) administration has been proposed in adults with autoimmune thyroiditis (AT), there is a paucity of similar data in children and adolescents. The purpose of the study was to investigate whether administration of a high dose of organic Se (200 μg daily as l-selenomethionine) has an effect on antithyroid antibody titres in children and adolescents with AT. METHODS: Seventy-one (71) children and adolescents, with a mean age of 11.3 ± 0.3 years (range 4.5-17.8), diagnosed with AT (antibodies against thyroid peroxidase [anti-TPO] and/or thyroglobulin [anti-Tg] ≥60 IU/mL, euthyroidism or treated hypothyroidism and goitre in thyroid gland ultrasonography) were randomized to receive 200 μg l-selenomethionine or placebo daily for 6 months. Blood samples were drawn for measurement of serum fT4, TSH, anti-TPO and anti-Tg levels, and thyroid gland ultrasonography was performed at the entry to the study and after 6 months of treatment. RESULTS AND DISCUSSION: At the end of the study, a statistically significantly higher reduction in anti-Tg levels was observed in the Se group compared to the placebo group (Δ: -70.9 ± 22.1 vs -6.7 ± 60.6 IU/mL, P = 0.021). Although anti-TPO levels were also decreased in the Se group, this change was not statistically different from that of the control group (Δ: -116.2 ± 68.4 vs +262.8 ± 255.5 IU/mL, P = 0.219). No significant difference in thyroid gland volume was observed between the two study groups (P > 0.05). WHAT IS NEW AND CONCLUSION: In this original study, organic Se supplementation appears to reduce anti-Tg levels in children and adolescents with AT.